The “supercar” is one of the most coveted classes of vehicles ever. They are known for high horsepower, impeccable handling, and exquisite driving; all wrapped in distinct designs ripped straight out of science fiction. However, these marvels of engineering have a history that begins as far back to the early days of racing. 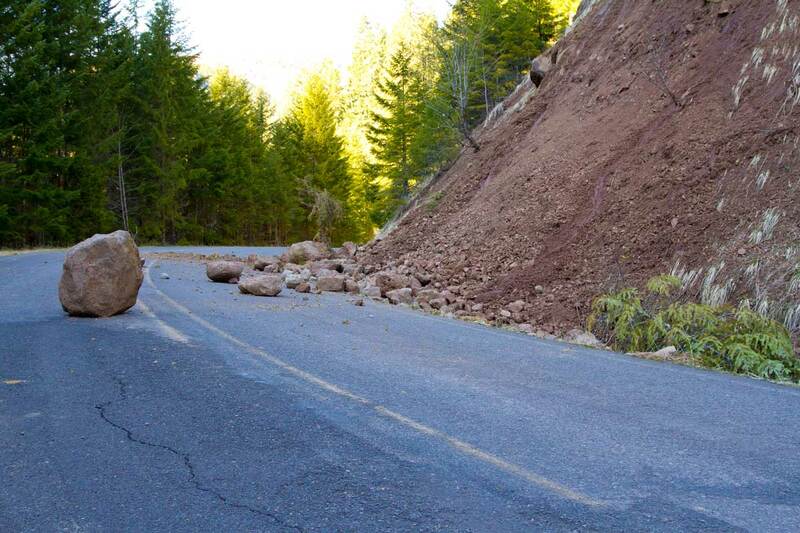 But it wasn’t until the evolution of consumer vehicles, when things really got moving. I guess you could say it all began with the Mercedes-Benz 300SL (W198), which was the first iteration of the SL-Class grand tourer and fastest production car of its day. Introduced in 1954 as a two-seat coupé with distinctive gull-wing doors (first of its kind), it was later offered as an open roadster. Built by Daimler-Benz AG, the direct fuel injected production model was based on the company’s highly successful, yet somewhat less powerful, carbureted overhead cam straight 6 1952 racer (the W194). The idea of a toned-down Gran Prix car, tailored to the affluent auto enthusiasts who thrived on performance and class, in post-war American market was suggested by the creative minds at the company. Lo and behold, Mercedes accepted the gamble and the new 300 SL was introduced at the 1954 New York Auto Show rather than the Frankfurt or Geneva gatherings company models made their usual debuts. 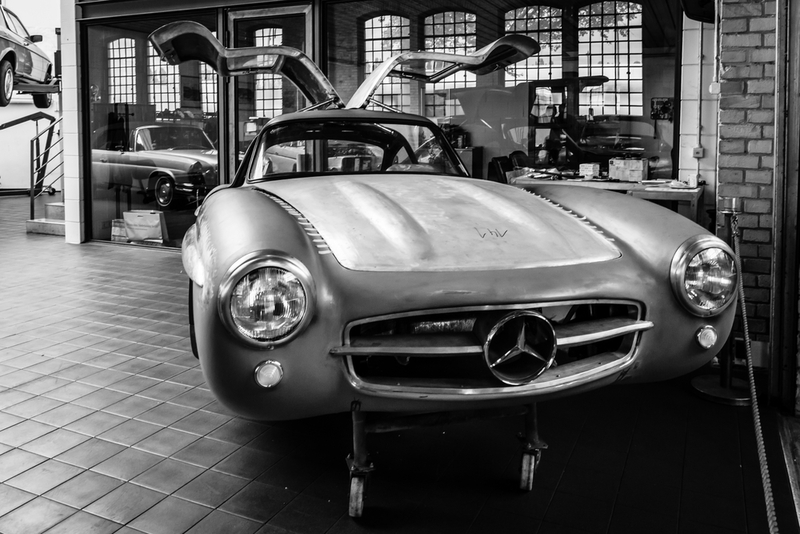 The progenitor of all future supercars was immediately successful and is still iconic even today, the 300SL stood alone with its distinctive doors, first-ever production fuel-injection, and world’s fastest top speed at the time. The original coupé was available from March 1955 to 1957, the roadster from 1957 to 1963. Later, a notably smaller, lighter, and less luxurious 1.9 liter roadster was introduced in 1955 as the 190SL. Both the 300SL and the 190SL were followed in the Mercedes line by the 230SL. And now you can trace the lineage of this car all the way down to today’s 571 hp (426 kW), nearly 200 mph (320 km/h), gull-winged Mercedes-Benz SLS AMG. Bag to the great ancestor of modern supercars: the racing W194 300SL was built around a welded aluminum tube space-frame chassis to offset its relatively underpowered carbureted engine. Designed by Daimler-Benz’s chief developing engineer, Rudolf Uhlenhaut, the metal skeleton saved weight while still providing a high level of strength. Since it enveloped the passenger compartment traditional doors were impossible, giving birth to the model’s distinctive gull-wing arrangement. Even with the upward opening doors, the 300SL had an unusually high sill, making entry and exit from the car’s cockpit problematic. A steering wheel with a tilt-away column was added to improve driver access. 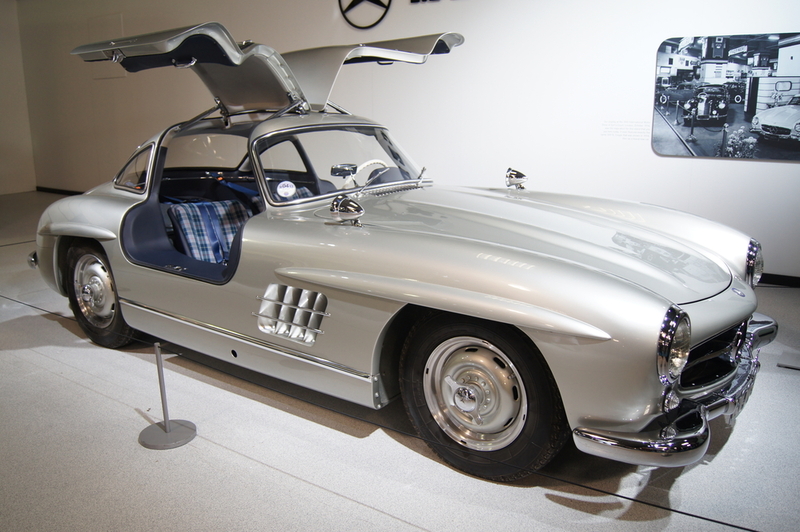 The 300SL’s main body was steel, with aluminum hood, doors and trunk lid. It could also be ordered with an 80 kg (176 lb) saving all-aluminum outer skin at tremendous added cost. 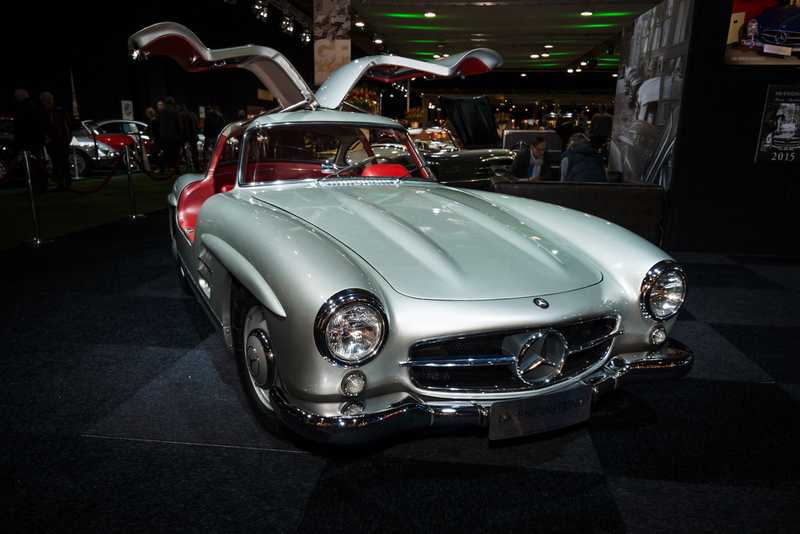 More than 80% of the vehicle’s total production of approximately 1400 units were sold in the US, making the Gullwing the first Mercedes-Benz widely successful outside its home market and thoroughly validating Hoffman’s prediction. This was post-war America, mind you when there is still a heavy anti-German sentiment. The 300SL is credited with changing the company’s image in America from a manufacturer of solid but staid luxury automobiles to one capable of rendering high-performance sports cars. This car was such a groundbreaker in more way than one, it was one of the early adopters of a mechanical direct fuel injection was installed, boosting power almost 25% over Mercedes’ Gran Prix cars. Derived from the DB 601 V12 used on the high-powered Messerschmitt Bf 109E fighter PLANE of World War II, it raised output from 175 hp (130 kW) to 215 hp (160 kW), almost double that of the original Type 300 sedan’s 115 hp (86 kW). The result was a top speed of up to 260 km/h (161 mph) depending on gear ratio and drag, making the 300SL the fastest production car of its time. Aerodynamics played an important role in the car’s speed, with Mercedes-Benz engineers placing horizontal “eyebrows” over the wheel openings to reduce drag. Unlike many cars of the 1950s, steering was relatively precise and the four-wheel independent suspension allowed for a reasonably comfortable ride and markedly better overall handling. However, the rear swing axle, jointed only at the differential, not at the wheels themselves, could be treacherous at high speeds or on imperfect roads due to extreme changes in camber. The enormous fuel tank capacity also caused a considerable difference in handling depending on the quantity of fuel on board. Today, the 300SL with its gull wing doors, technological firsts, and low production numbers is considered one of the most collectible Mercedes-Benz models, with prices generally in the US$1,000,000-2,500,000 range. 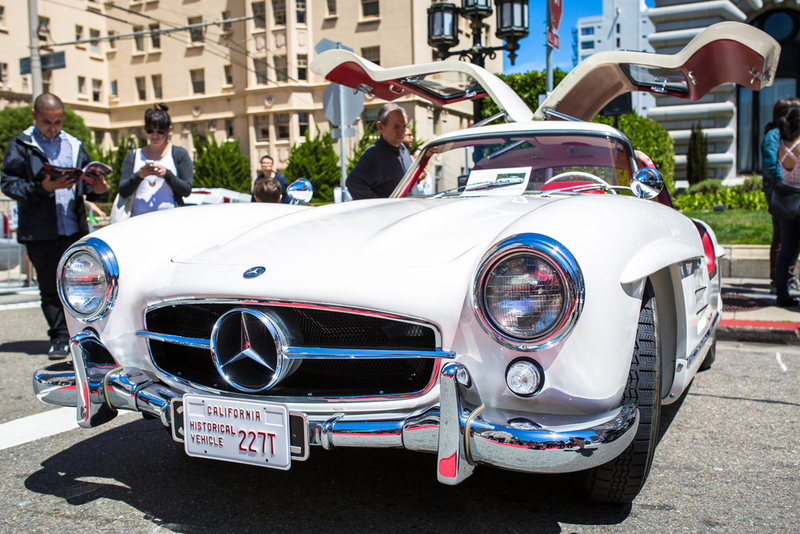 Sports Car International magazine ranked the 300SL as the 5th best sports car of all time. Given the stratospheric prices that a 300SL commands, many luxury car enthusiasts have turned towards the smaller 190SL, often referred as the “poor man’s 300SL” as its acquisition costs are usually a tenth that of the 300SL’s. Subsequent generations of the Mercedes-Benz SL-Class have been continually produced, not always in the same sporting spirit of the original 300SL, such as the Mercedes-Benz W113 (1963-71) and the Mercedes-Benz R129 (1989-2001). In the 2000s Mercedes oriented its SL series back towards performance, and included styling nods to the 300SL. The R230 (2002-2011) and the R231 (2012-present) have air inlets in the front fenders which are inspired by the 300SL Gullwing. However, the SL has since evolved to become a more autobahn-focused grand tourer due to increasing weight, especially with its optional V12 engine in later iterations. The last two generations of the SL are hardtop convertibles with technological and comfort amenities, and it also has available heated and cooled seats with a massage function. The first huge step away from this trend towards luxury and comfort over performance was the Mercedes-Benz SLR McLaren, a Mercedes-Benz-McLaren Automotive joint venture that featured a hand-built 5.4-litre, supercharged 626 PS (460 kW; 617 hp) all-aluminum V8 engine. The 571 PS (420 kW; 563 hp) 6,208 cc (378.8 cu in) V8 powered Mercedes-Benz SLS AMG made its debut in 2009. Described by Mercedes as a true successor to the 300SL it was geared to out-and-out performance while still maintaining expected Mercedes luxury, peaking at 631 PS (464 kW; 622 hp) in the 6,208 cc (378.8 cu in) Coupé Black Series introduced in 2013. Unfortunately, the SLS AMG production was brought to a close at the end of 2014. The SLS AMG has now been replaced by a substantially less costly tourer called the AMG GT with traditional doors and a much smaller forced induction engine, designed to compete against the Porsche 911 and Audi R8. Yet, still the legacy of this landmark vehicle remains in the design for nearly every other supercar ever built.